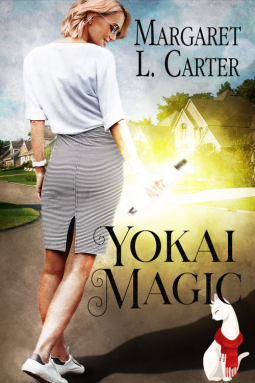 Yokai Magic by Margaret L. Carter is an adult fantasy involving magic. At novella length of course you are going to hear that old not much depth to it but the story wan’t too bad for a short read. After her parents passing Val has moved into their home in order to get it cleaned out and fixed up to be ready to sale the property. Going through some old things around the house she happens upon some things her grandfather had brought back from Japan. Val had thought maybe the items she was uncovering may hold a bit of value to help pay for repairs but when she comes across a Japanese scroll and a cat figurine in a box little does she know she’s unleashed centuries old magic. Before Val knows it she has a spirit named Yuki in the form of a cat explaining all the magic around her. The author tried to pack a lot into such a short read with an old flame from next door coming back for a little romance along with the magical world she created. I’ll admit this one could use a bit of editing to be more polished as the flow seemed a bit off but it was still a fun read despite lacking the depth a longer book would bring.